After women's suffrage had been achieved, its leaders branched out to support other movements that aided the advancement of women in society. Consequently, the contacts made by Cornell home economics department in the suffrage movement promoted home economics during the 1920s. In 1925, Carrie Chapman Catt chose to visit Cornell's College of Home Economics to observe how the college's programs for farm wives respond to the media's influences on a person's interpretation of information. 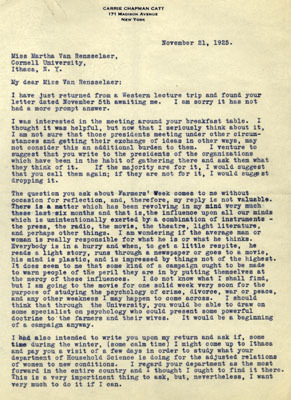 She wrote to Van Rensselaer: "...I might come up to Ithaca and pay you a visit for a few days in order to study what your department of Household Science is doing for the adjusted relations of women to new conditions. I regard your department as the most forward in the entire country and I thought I ought to find it there."